Vancouver’s Vision Critical has secured $20 million in financing from the venture capital arm of the Ontario Municipal Employees Retirement System. VisionCritical was founded by Andrew Reid, son of legendaryCanadianpollster Angus Reid. (Andrew is now co-CEO and Angus is chairman of thefirm.) The company uses online panels to provide user and customerfeedback for over 600 clients on their products and services, a sort ofWeb version of traditional product testing focus groups. Andrew Reid launched Vision Critical in 2000, the same year his fathersold the polling and market research firm Angus Reid Group toParis-based Ipsos SA for a reported $100 million. The elder Reid laterformed a new polling and research company, Angus Reid Public Opinion. 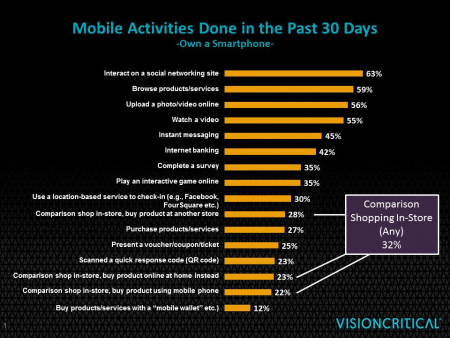 Screen shot of data on smartphoneuse analyzed by Vision Critical. Some of Vision Critical’s past and current clients include corporateheavy hitters like Eastman Kodak Company, JetBlue Airways Corp., BananaRepublic, Virgin Mobile, NASCAR and hotel chain Marriott InternationalInc. With $55 billion in assets, OMERS is one of Canada’s largest pensionplans. Its VC division OMERS Ventures has been making a string ofinvestments in tech-related companies lately. On Aug. 17 it put $12million into Hopper, an online travel search Web site basedinMontreal. In May it took part in a series B round raised byToronto’sWave Accounting worth $12 million. And back in March it took a$20-million stake in Vancouver’s Hootsuite Media Inc.